Ms. Flack's books always impress from the start, if for no other reason than the fonts always rock. Her use of soft, primary colors. Her dark lines and familiar but tense situations. I think all of her books are divine, and although The Story About Ping will probably go down as my son's all time favorite children's book (for bird-related reasons), he just might think Angus is a whole lot funnier. 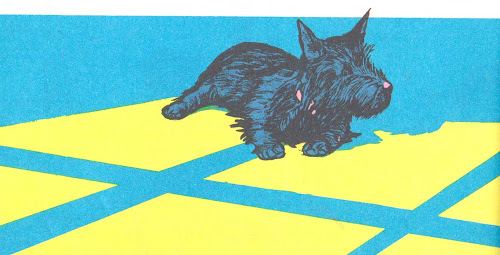 One in a short series of books that follow the exploits of a frisky Scottish terrier, here we find him pitted against a neighborhood feline in a friendly game of catch that cat. Now as Angus grew older and longer he learned MANY THINGS. He learned it is best to stay in one's own yard and FROGS can jump but NOT to jump after them and BALLOONS go POP! Angus also learned NOT to lie on the sofa and NOT to take SOMEONE ELSE'S food and things like that. But there was SOMETHING outdoors Angus was very curious about but had NEVER learned about, and that was CATS. The leash was too SHORT. 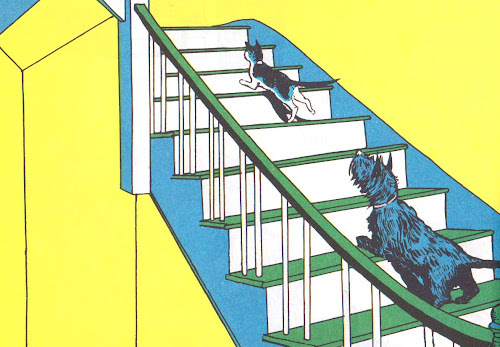 Oh, Angus learns alright and as the book progresses and the cat continues to elude, the story is a series of just-missed-him funny situations that bring my son to his knees in peals of laughter. The tale is spectacularly well-written, and the language isn't the least bit dated (which explains why it's been in print all these years). That black dog is a charmer, big time. If anyone has an extra copy of Angus and the Ducks sitting around, please send it my way and maybe we can bump this puppy up to Number 1 status in the boy's heart of hearts. A little quack, quack will surely put him over the line. Marjorie Flack has also been in some of those "Best in Children's Books"... "Wait for William" is the only one I can think of right now. I just love those colors. How beautiful those pages must look in person - the book doesn't seem to have faded much at all. And that touch of pink on the cover is divine! Another one for me to look out for. I love those colours! This is one of my all-time favorite kids books. 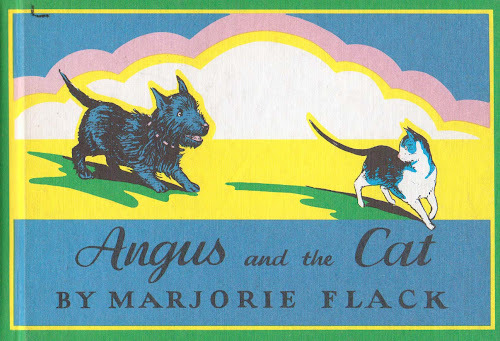 I especially love the ending- "Angus knew and the cat knew that Angus knew that Angus was glad the cat came back". Yes, I have my copy nearby LOL. I also have Angus and the Ducks (1930)it is very cute too. I love Flack's attention to shadows. Angus and the Ducks is one of my fav's. My littler kids always giggle when they see the cat hiding on the roof, just out of Angus' sight. Great pick.